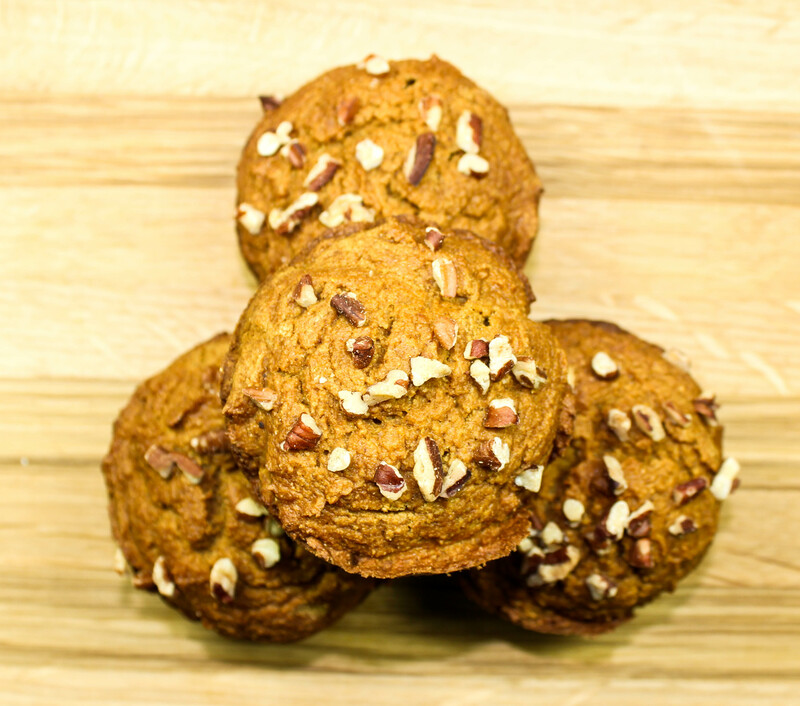 Pumpkin Pecan Muffins are packed with delicious fall flavors. Light, crunchy on top, and great for grab and go breakfast. Low fat and Weight Watchers friendly recipe- 6 SmartPoints! Yep, it’s almost Thanksgiving! One of my favorite times of the year. A time to reflect and give thanks, spend time with family, and eat. What more could you ask for! Aside from the food, what makes me love Thanksgiving is hearing about the family traditions other people have. I grew up eating Thanksgiving dinner in the early afternoon, so in the morning of Thanksgiving I tried my hardest to not eat a big breakfast. My Pumpkin Pecan Muffins are the perfect festive and light breakfast for Thanksgiving or any time of year. Light, packed with pumpkin flavors, and crunchy on top, these muffins will make you want seconds. Delicious but still low fat! This is a Weight Watchers friendly recipe and each muffin is 6 SmartPoints. Food is magic… it brings people together and builds traditions. Growing up, my family spent Thanksgiving at my grandparents’ house. We usually ate Thanksgiving dinner as “lunch” and ate around 2 or 3pm. I’m thinking the reason why we ate so early in the day is to ensure that we would have plenty of room for the pie later :)! There was always so many pies, almost 1 pie per person! As kids, my brother and I were always careful about not eating too much for breakfast so that we could have room for Thanksgiving, because not only did we need room for 1 plate, but we need room for 2 plates of food! One of my favorite Thanksgiving traditions was making pies with my grandmother, Momo. When I was a teenager, I would go over to her house a few days before Thanksgiving, help her make the pie dough by hand, and make the pie filling. Raisin, Lemon Meringue, Coconut, Chocolate, and my favorite… Pecan Pie. In college, I would even try to take off work from my part time job so that I could come home early and make pies with her. Such special times! While I LOVE pecan pie, my other favorite pie is pumpkin pie. Classic Thanksgiving flavors right there! A while back, I was reminiscing about all my childhood Thanksgiving memories and remembered how excited I was the morning of Thanksgiving to eat the delicious food my family made. While thinking about traditional Thanksgiving food, I started to think about how I could make a new recipe for Thanksgiving. Instead of a side, I wanted to create a breakfast item to really shake things up. Breakfast is always something that I want to eat on Thanksgiving but usually avoid for fear that I will eat too much and not have room for later. I knew I should create something light and capture my favorite Thanksgiving dessert flavors: pumpkin and pecan. 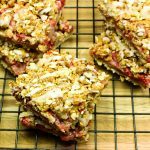 I wanted to make something that I could bake, then have on hand eat throughout the week for a quick breakfast or snack :). Bread, muffins, and granola bars are my favorite kind of breakfast. Once I bake them, there’s no more work and I’m left with already made breakfast for the week. The consistency of these Pumpkin Pecan Muffins is basically the same as banana bread, which my husband and I love to eat. I like the idea of muffins because there’s no slicing so they are ready to grab in the morning. These muffins taste like all the flavors of pumpkin pie and have the crunch of pecan pie. Moist, fluffy, not to heavy, and easy to make! After I made these for the first time and they passed the test kitchen taste test, they are a MUST on my Thanksgiving Day recipes. These muffins scream Fall flavors!! 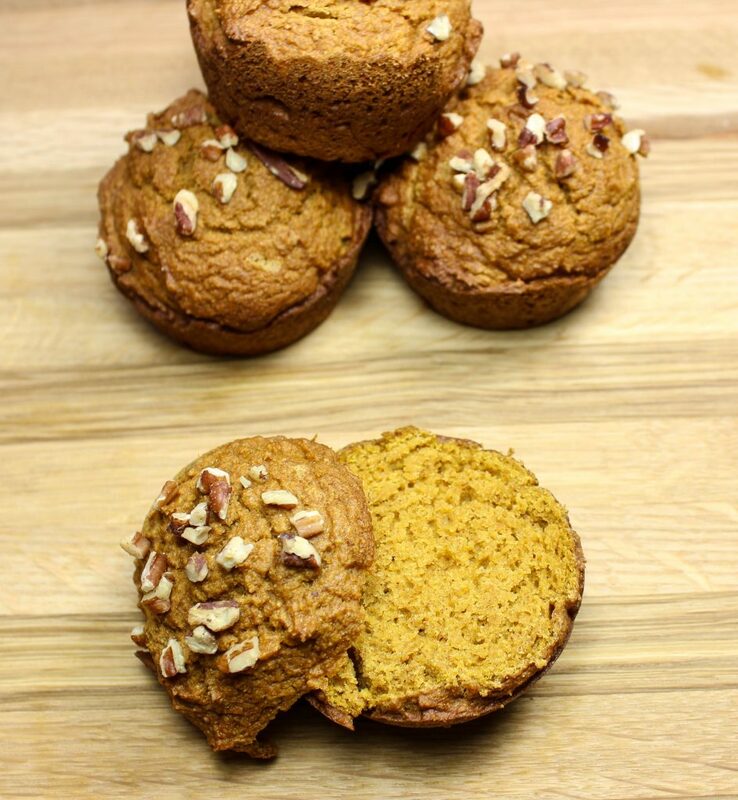 I always have canned pumpkin in my pantry this time of you (as I’m sure you do), so these muffins are a GREAT way to use the canned pumpkin up. For this recipe, make sure to use canned pumpkin puree and not canned pumpkin PIE puree. If you have homemade pumpkin puree, that would work even better! These muffins are super easy to make. 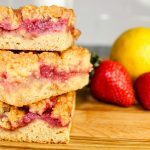 In a large bowl using a Kitchen Aid mixer or a hand mixer, mix light brown sugar, stevia baking blend (no calories sugar substitute) and softened butter until the mixture is creamy and fluffy. I chose to use stevia because it has less Weight Watcher points than regular sugar without comprising on the flavor. You can’t tell that it isn’t sugar. In fact, I didn’t even tell my husband about the substitute; he loved these muffins so much that he threatened to eat all 12 muffins in one day (he still has no idea that I didn’t use real sugar). To the sugar mixture, add two egg whites and blend until fluffy. Next, add pumpkin puree and vanilla. In another large bowl, mix white whole wheat flour, baking powder, baking soda, salt, and pumpkin spice. Slowly add the flour mixture to the sugar/egg mixture and blend well. Pour the batter into muffins tins that are sprayed with cooking spray and bang the muffin tin on the counter a few times so that the batter can flatten out. Finally, sprinkle on top of the muffins the chopped pecans. The muffins bake for about 25 minutes or so. Pumpkin Pecan Muffins are the perfect festive and light breakfast packed with all the Thanksgiving flavors you love. Light, crunchy on top, and easy to make. These muffins are so delicious you wouldn’t believe that they are low fat! Great for a quick grab and go breakfast or perfect for a quick and light breakfast the morning of Thanksgiving! Pre-heat oven to 350 degrees. Spray muffin tin pan cooking spray. Set eggs and butter on counter to bring them to room temperature. In large bowl, mix flour, pumpkin spice, baking powder, baking soda, and salt. In large bowl using a stand mixer or hand mixer, blend brown sugar, stevia, and softened butter until well combined and creamy, about 4 minutes. Slowly add egg whites one at a time. Add pumpkin and vanilla. Mix well. While mixer is on, slowly add in flour mixture. Pour batter into muffins tins ensuring each muffin tin is even. Bake for 25 minutes until muffins center is cooked. Poke a toothpick through the center of the muffin and if the toothpick comes out clean, the muffins are done. 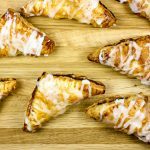 November 13, 2016 at 7:48 pm These look delicious! I chopped up all of my Halloween pumpkins that I was using as decoration and have a giant bowl of roasted pumpkin - I know how I'm going to use it! November 14, 2016 at 10:40 am Yes! Use up that delicious pumpkin puree :). Thank you so much for commenting Maryn! November 14, 2016 at 10:42 am I hope you do Rachel!! Thank you so much for commenting! 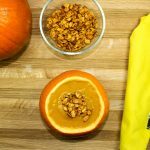 November 14, 2016 at 10:42 am I cannot get enough pumpkin this time of year :)!!! Thanks so much for commenting Gloryanna! November 14, 2016 at 1:05 pm WE have the pumpkin! We will commence the baking in 5 days. November 14, 2016 at 3:01 pm Yes, perfect!!! Thanks so much for commenting Miri! November 14, 2016 at 3:09 pm Thanksgiving always reminds me of getting ready to go to Grandma's. Lots of fond memories! These muffins sounds delicious! Going to make these as I just bought a big bag of pecans at the store. Thanks for sharing! November 15, 2016 at 11:51 am I love the holidays and remembering all those great memories :). I hope you make these soon!! Thanks so much for commenting Katharine!